Pass Your TOGAF 9 Foundation Exams - 100% Money Back Guarantee! The purpose of certification to TOGAF 9 Level 1 (TOGAF 9 Foundation), is to provide validation that the Candidate has gained understanding of the structure, terminology, and basic concepts of the TOGAF 9 standard. The candidate also understands the core principles of Enterprise Architecture and the TOGAF standard. The learning objectives at this level focus on knowledge and understanding. There are two levels to certification: Level 1, known as TOGAF 9 Foundation, and Level 2, known as TOGAF 9 Certified. Level 2 contains the learning requirements for Level 1. There are a number of different learning paths to obtain certification. 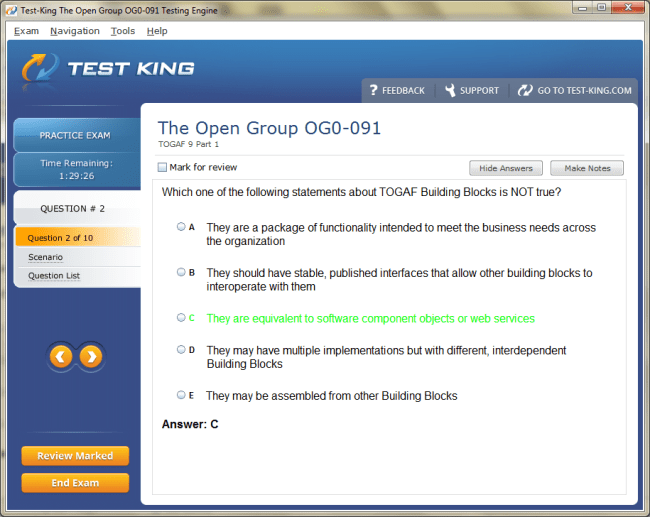 The TOGAF part 1 exam is a closed book, multiple choice, with 40 questions. You will have 60 minutes to complete the exam. Who should get TOGAF 9 certified? Architectsthat are employed in an organization where the TOGAF 9 standard has been accepted. Architects that are involved in architecture projects. Professionals who want to take their TOGAF certification to the next level. Why should you get TOGAF9 certified? The certifications will promote your career advancement and will assist you in leading at your occupationin a in a big way. Studies show that certified professionals get faster promotions and higher salaries. I am an ITIL v3 Expert Service and Solution Architect and have been looking at TOGAF certification as a possible addition to my resume. This is driven by my desire to augment my previous work experience in planning enterprise wide Service Management solutions with a formal certification and to reinforce my skill set, with the goal of providing me more career opportunities. Jeff Westin, Principal Service Manager at Dadini, Inc.
Now you can practice your study skills and test your knowledge anytime and anywhere you happen to be with PDF Version of your OG0-091 exam. OG0-091 Questions & Answers PDF Version file has an industry standard file format .pdf. You can use any .pdf reader application like Adobe Acrobat Reader or many other readers to view your PDF file. Printable OG0-091 Questions & Answers PDF Version gives you comfort to read at leasure without using your computer or gadget. Experience Test-King The Open Group OG0-091 exam Q&A testing engine for yourself.